I was recently asked by the marketing analyst for Uniformed Scrubs, an online retailer of medical scrubs, shoes, and accessories if I can do a product review of their new spring and summer scrub top line. I told myself, Why not?!. 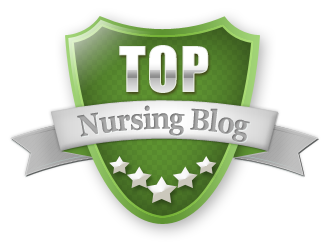 I have never done one on my blog. 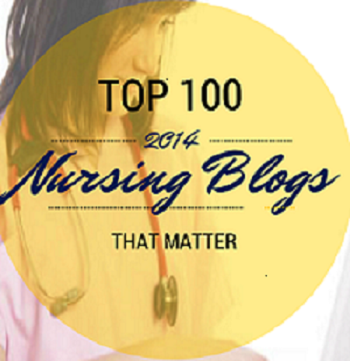 Yet, we nurses are constantly forming ideas and our own personal opinions of the gadgets we use for work. We just don't "publish" it. I figured this would be a great opportunity to do one. There is always first time for everything, right? I received this top. 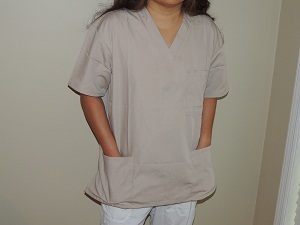 It is their Adar 601 Three Pocket V-Neck Tunic Scrub Top. I was hoping I'd receive the white or royal blue scrub top. Those are the only colors we can wear at work. I guess, due to product availability, they sent me the Khaki, my third color of choice. After washing and drying it, (guess what, it did not shrink), I wore it around the house, filled the pockets with stuff I usually carry at work and formulated my opinion about the scrub top. Additionally, since I cannot wear it to work, I had one of the unit secretaries wear it to work, ( they wear khaki scrubs to work), so she can help review the top. The top is very comfortable. I got the medium, the size I ordered, and I would have to say that it fit perfect. I am 5'2, medium built, and this top has plenty of room to move around in. . It is not too long or too short, Just the right length. I wore it with my low rise scrub pant and it is nice to know that it covered my behind when I picked up something off the floor. It came with two side slits, making the top more versatile while moving around. I have always had problems with the shoulders being a little tight with my other scrubs, This brand had enough room. I did not feel constricted at all. Personally, I have never owned a tunic style scrub top. Maybe I need to start choosing tunics. So, I checked out more nurse scrub top on their site and found some really cute ones. This top also has 3 huge pockets. One on the top left and two on the bottom. The pockets are deep enough to stuff with gears we nurses use at work, without worrying that pockets will overflow. The top pocket has a sewn in pen holder/ divider which I like. I personally don't use them as a pen holder. I like to use it as an area where I can clip my badge in place. The material is 65% polyester and 35% cotton. I was a little hesitant about the polyester, but this top did not make me itch. It felt soft after washing and drying with fabric softener. My friend unit secretary liked the scrub, too. For her time, I gave her the top since she can use it more than I can. My only complaint....... It's not white or royal blue. I cannot use it at work. But glad my friend can put it to good use. Overall, a very decent scrub top. If you want to check out Uniformed Scrub site, please do so. I have a coupon code "trueblue" which is 15% off until July 31st 2013. Disclosure: I received an Adar scrub top in exchange for this review, The review is my own opinion. That's a great alternative to the usual scrub top. The dental school rankings 2014 are very proudly present their countries who won this title. I really very happy for all of them who have won. Bahis ve kaçak iddaa oynamak oldukça zevklidir. 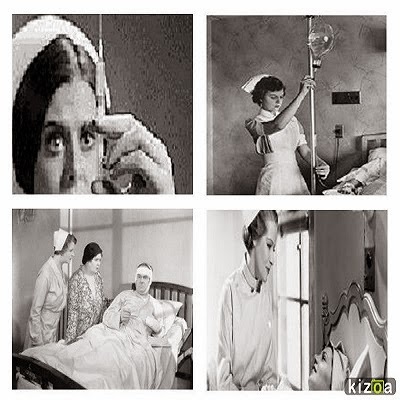 Bu zevki daha uzun soluklu ve canlı bir şekilde yaşamak için mutlaka kaçak iddaa siteleri üzerinden oynayın.